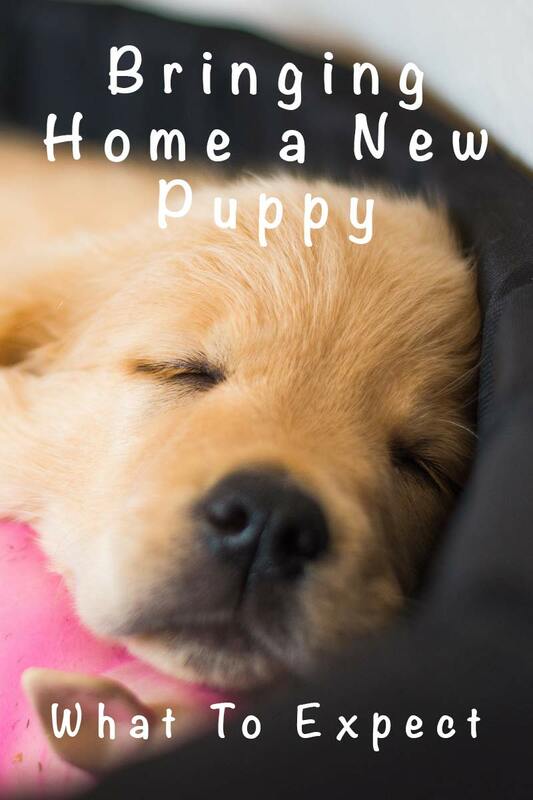 This is a complete guide to bringing home a new puppy for the very first time. It’s ideal for a first time dog owner. Or anyone that has forgotten what an 8 week old puppy gets up to! Life with a puppy is easier when you are well prepared. 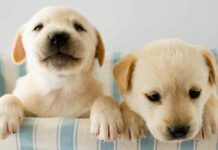 This article will explain what to expect of your 8 week old Lab puppy, during those first few days and weeks. It goes without saying that new puppies are completely adorable! Nature has the design of baby animals down to perfection. And when we hold an 8 week old Labrador puppy in our arms we are overwhelmed with the need to protect him. Despite this, there will probably be times during the next few days when you question the sanity of your decision to get a puppy at all. Is your 8 week old puppy driving you crazy? No matter how cute and adorable he is, there may be times in the weeks to come when you tempted to take your pup right back where he came from! Because puppies, like babies, can be hard work. Not to mention annoying, and frustrating! But hang on in there. When you are sleep deprived and your life has just been turned upside down it isn’t the best time to make major decisions. With the help of this guide and the resources you’ll find on this website, peace will soon be restored. There are some handy links in the green menu if you want to skip ahead! We’ll look at some of the areas where puppies and new puppy parents may come into conflict in a moment. But first let’s deal with some common new puppy parent worries. Let’s start by talking about feeding an 8 week old puppy and getting through that first night with your tiny new friend. And looking after a puppy with diarrhea is no fun. So don’t be tempted to let your puppy keep eating just because he seems hungry. 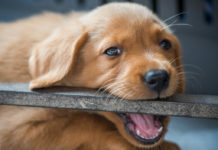 Which he will, because Labrador puppies are always hungry! You have to ration out his food for him. You need to know how much your puppy needs to eat in a 24 hour period, and then divide that amount between at least 4 meals. 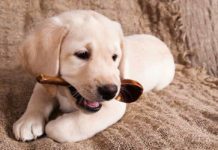 All this information and much more, is contained in our detailed guide to feeding a Labrador puppy. Just click on that link and you’ll be there! We’ll look at some options and give you some tips on things to avoid. It’s best not to expect your puppy to sleep in or on your bed. He’ll fall off, possibly hurt himself, and certainly wander around your bedroom leaving little puddles. He’ll also spend time getting stuck behind the wardrobe and chewing through the cables to your bedside lamp. Later on you can bed share with your Lab but not right now, at least not unless you puppy proof the room and sleep on the floor. It’s also best not to leave an 8 week old puppy free to roam the house at night. There is so much potential for harm. Even if you only sleep for six hours or so, there is a great deal of mischief a puppy can get up to in that time. The first two options enable you to sleep separately from your puppy. This isn’t always a good idea to begin with. I’ll explain why in a moment. Just before you go to bed and after taking your outside to empty himself, you can put the puppy to bed in a puppy proof room with a washable floor. Or you can put his bed inside a large puppy playpen. Put plenty of newspaper or puppy pads down to cover most of the floor. He’ll pee and poop on this during the night and you’ll need to clean up promptly in the morning to avoid him jumping in it. Alternatively you can shut your puppy in a small enough crate and set an alarm to remind you to take him out during the night. Placing your puppy in a cosy nest in a tall strong cardboard box next to your bed gives a puppy a great start to his new life. You will probably still need to get up in the night, but you won’t need to set an alarm (or possibly wake up a puppy that would have slept through) because you’ll hear your puppy stir and whimper when he needs to go out to pee. If he is just a little worried, you’ll be able to stroke and comfort him without getting out of bed. No. 3 is a good solution to begin with because puppies subjected to solutions 1 or 2 can become extremely distressed, resulting in vomiting and diarrhea for your pup, and a lot of clearing up for you. Remember that most 8 week old puppies have never slept alone. If asked to sleep alone on the first night in their new home, they usually cry. That’s something of an understatement because a small puppy can make a surprisingly loud noise. For a surprisingly long time. Unless you live in a mansion, you will be able to hear him. And so will your neighbours. The best way around this, is to have the puppy sleep next to you for the first few nights as described in Option 3 above. It doesn’t have to be permanent. Once the puppy has settled in and isn’t so homesick, you’ll be able to move him to his own room if you want to. If you decide to do it the hard way, check out this article for information on coping with crying. It is important to be aware that new puppies learn very quickly. Whilst initial crying may be the result of fear or loneliness, puppies they soon discover that crying gets them attention. If you have already got into a cycle of crying for attention with your new puppy, find out here, how to teach your puppy to be quiet. 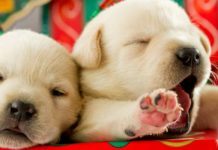 An 8 week old puppy can be expected to spend around 18 to 20 hours asleep out of every 24. The phase where puppies fall asleep easily on your lap or in your arms doesn’t last long. But dogs continue to sleep for long periods throughout their lives. Potty training your 8 week old puppy. Over the next few weeks you’ll want your puppy to become clean and dry in the house. Potty training your 8 week old Labrador puppy can start on the very first day. But it’s important that you are aware of his limitations. A few new puppies can last six or seven hours at night without a wee. But many cannot do this until they are around ten weeks old. If you crate your puppy at night, expect to get up in the middle night and take your puppy outside for a wee, for up to two weeks. If you opt to leave your puppy at night with puppy pads or newspaper, expect it to take a little longer than this before you come down to a nice clean floor each morning. Getting up earlier for a while is a given with an 8 week old puppy . And it’s best to expect no more ‘lay-ins’ for at least the next four months. During the day, you’ll need to take your puppy outside very frequently or provide him with an a toileting area with puppy pads. Puppies pee much more frequently often the day. Some new puppies can last an hour or so between wees, but again, many cannot. Check out our Big Guide To Potty Training for lots more tips and information. And if you are struggling you’ll want to skip to 15 potty training problems solved. Yours will be in there! If you are intending to crate train your new puppy, you’ll find comprehensive instructions, including crate training schedules and maximum recommended crate times in our crate training guide. 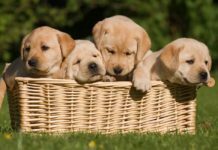 If you are going back to work, or want to leave your puppy for three to four hours before he is five or six months old, and you want to crate train, you need to arrange for someone else to take care of him during the day. Even for this short period of time. An 8 week old puppy should not be left in a crate for hours at a time during the day. The secret to success in crate training a new puppy lies in getting good habits established from the start. And this means getting that puppy outside to his toilet area, whenever his little bladder is getting full. Puppies do need to learn to cope with being alone for short periods, right from the very start. Your puppy will quickly become comfortable with you disappearing for a few minutes if you reliably return. But too much isolation is a common cause of noisy or destructive behaviour. Puppies need company. 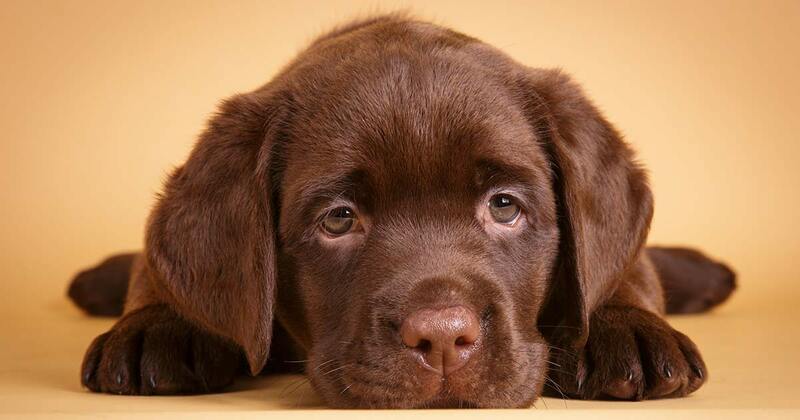 Older puppies may cope happily with being left for up to four hours, but even an adult Labrador may become distressed or destructive if left alone for a full working day on a regular basis. Labradors are very sociable dogs and they need to have people around them. Essentially it isn’t appropriate to leave a Labrador home alone throughout the entire working week. No matter how many walks he gets at the weekend. If you intend to return to work full-time, you’ll need to arrange a dog walker or creche place for your friend. Most people know that puppies nip when teething. What many people don’t know is just how hard they bite, and how much it hurts. Most new puppy owners are shocked by biting, and by the noise which accompanies it. But fierce growling during play biting, is completely normal for small puppies! Being aware of this doesn’t make it any less painful, but it does help you cope, and prevents family members resenting the puppy or worrying that he is abnormal in some way. 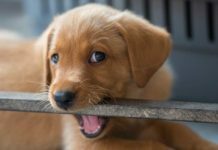 You can find out a lot more about biting in this article: How to cope with a biting puppy and this one Is my puppy aggressive? Again, most people know that small puppies chew things. However, it can be quite a shock to discover just how destructive a Labrador can be, both indoors and out, especially if left unsupervised for long periods of time. Expect your puppy to destroy anything he can get in his mouth. Indoors and out. Expect this to continue well past his first birthday. In fact many young Labradors become particularly destructive towards the end of the first year. Some even chew the skirting boards, rip plaster from the walls, and tear up carpets in their homes. 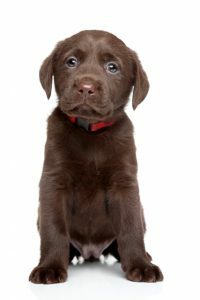 There is no need to get into this kind of conflict with any dog, and as it is so common in Labradors, I recommend that young Labs are crated or confined to a puppy proof room when left alone in the house, until well past their first birthday. Between 8 and 18 months of age, many young Labradors are extremely boisterous. Expect that your young Labrador will knock people over if you don’t teach him some manners. Expect that he will jump up and scratch the paintwork on your car if you don’t teach him to sit next to it. Expect that he will drag you around on the end of his lead if you don’t train him to walk to heel. Expect that he may even pull you off your feet and into the path of an oncoming vehicle. Tiny puppies have an automatic response with means that they follow people around. This response disappears by the time the puppy is around four or five months old. Don’t wait until then to let your puppy off the lead. Labradors are gun dogs. They love to hunt and follow scent trails. Expect that an older puppy will want to explore away from you and get that off lead recall established well before he is six months old. Expect that an older puppy will stray further and further away on walks if you are too predictable and just traipse along behind him. He also does all kinds of ‘naughty’ things such as taking food he can reach, begging at the table, and tripping people up! What can be done? The answer is, an 8 week old puppy is not naughty when he does these things, he is completely normal. He is also completely untrained. Puppies bite, steal, jump, lick, whine, dig, and much more. All this is normal. Training is a long process. Getting a dog to respond to a cue such as ‘sit’ or ‘shake hands’ is the easy part. A dog that will do this in your kitchen is not trained. He has just learned to respond to a cue in your kitchen. Nothing more. We expect an awful lot from our tiny puppies. Both when they are still very small, and then as they grow bigger. We expect that puppies will enjoy being cuddled. Sometimes they do, mostly they are just being polite. Many puppies don’t like being hugged at all and wriggle wildly to escape. TIP: Wait for your puppy to stop wriggling before you place him on the floor or he will wriggle harder next time! We expect that the efforts we put in to housetraining will be rewarded, that the puppy will listen to what we say. But potty training and obedience training take time. Your 8 week old puppy will have accidents in the house to begin with and needs your help to understand what you want him to do next. As he grows, we expect our puppy to return our love and affection, to respect us, be loyal, and obedient. And he will be, in time. The reality of life with an 8 week old Labrador puppy, can be a bit of a shock. Many of us do not expect weeks of broken sleep, and tearful children that can’t play with, or even stroke the puppy, because he bites so hard. Nor had we anticipated just how depressing it would be to clear up puppy pee and poop every time we get up in the morning, or return home from a quick shopping trip. We hadn’t planned on the angry complaints from the neighbours about barking and whining whenever we leave the house either. These things probably won’t all be issues for you. But they are common reasons for people to become disenchanted with their furry companion. And you’ll cope better if you are prepared. One of our aims here on The Labrador Site is to help close this gap between expectations and reality. So that puppies go into their new homes, and stay there for the rest of their lives. You can do this if you are ready. Do think about restricting your puppy’s access to certain parts of your home for a few weeks. Much puppy naughtiness is linked to over-excitement. 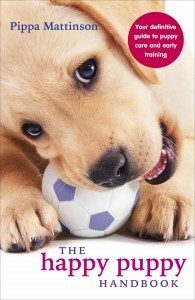 Focus on being calm around your puppy, and read up on how to train your puppy effectively. The considered and appropriate use of a crate and baby gates, is a great way to prevent conflict between puppies and their families. Confinement is not a substitute for companionship and training though, and of course it is very important to be sure you have enough time in your life for a Labrador, before going ahead and getting that lovely puppy. Do check out our article: are you ready for a Labrador, before you take the plunge. And if you find your new puppy much harder than you expected and are feeling out of your depth or struggling to cope, don’t suffer in silence. I just want you, and everyone associated with your site, to know how much we appreciate all the information you provide. This Website and the Happy Puppy Handbook were invaluable while raising our now 2-year-old Lab. Now we’re back because we are going to make an addition to the family and it feels like I’ve forgotten everything! Thankfully, your Website is bringing the memories back, the dos and dont’s, the expectations versus reality. And this time we’re going to be also looking for information on the dynamics of introducing a puppy to a household with an adult dog. Cheers and thank you again for a job well done! That’s so lovely hear, Ron. Thank you! I hope you have a great time finding and bringing home your new puppy.